A large equipment manufacturer produces air compressors for high pressure applications all over the world. Their specialty is custom equipment. They ship (300-600) units per year and their standard delivery is (4-6) weeks. As their business grew, their in-house panel shop couldn’t keep up with their production requirements. Their goal was to find a panel shop to help them maintain their growth and keep up with production. Shipment delays and cost overruns were being caused by control panel problems. They built standard control panels for stock and modified them to suit compressors headed for final assembly. Stock panels were made unusable when parts were robbed from one to modify another. Custom control panels were always a problem. There was engineering support for applications and their mechanical equipment, but none for electrical control panels. For many years this wasn’t an issue but became an issue as competition intensified and custom orders became more complicated. Their Engineering VP was constantly distracted solving control panel problems. 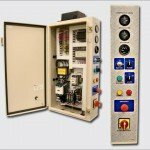 We are their engineering support for electrical control panels. If we make a mistake, it’s our problem. 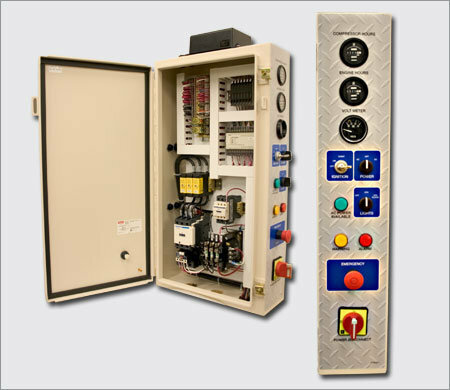 Their Engineering VP is no longer distracted solving control panel problems..
We provided a fixed price list for standard control panel configurations. When Sales receives a custom Request for Quote, they send us the control panel specifications. We review the specifications and quote to specification before their quote deadline. When they get an order, we send a Submittal for Approval. After approval, they send us an order. We produce on budget, 100% Function Test, and deliver on schedule to their production facility. Control panels are no longer an inventory problem or a production problem, and their Engineering VP can focus on his primary function.